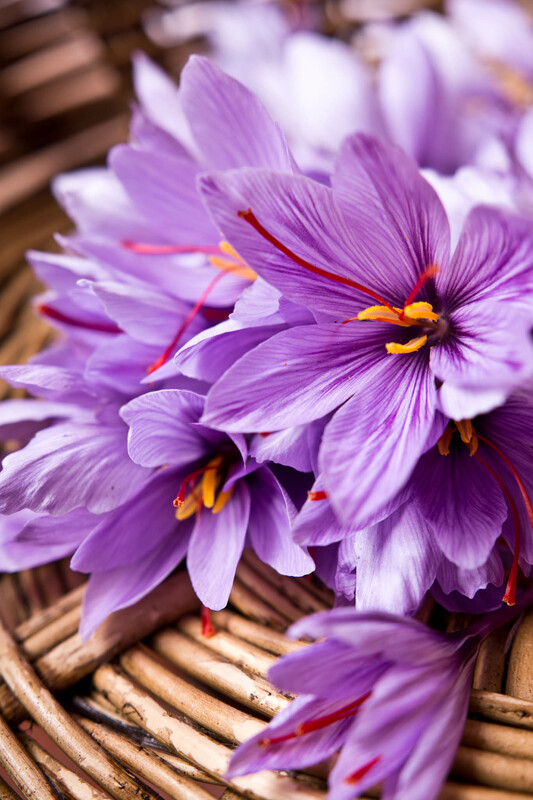 In Autumn, every morning for a fortnight or so, I go up to my damp and dew-laden vegetable garden, armed with a basket and a long shiny pair of tweezers, to harvest saffron. The pretty lilac flowers are short lived. They last a day, two at the most, especially in the bright autumn sunlight. Each bloom bears three canary yellow stamens and three long, luscious bright vermillion stigmas. These delicate stigmas, once harvested and dried are more valuable than any other spice. They are Saffron. Whilst gently parting the base of the petals to expose the bottom of the stigmas, I contemplate the birth of saffron. Are they the result of a single genetic abnormality? Not all crocus flowers bear saffron. Crocus cartwrightianus, often described as wild saffron is thought to be the parent of crocus sativus, the cultivated, sterile saffron that I have planted in my garden. Like tulips, they are genetically clones. They cannot produce viable seeds. 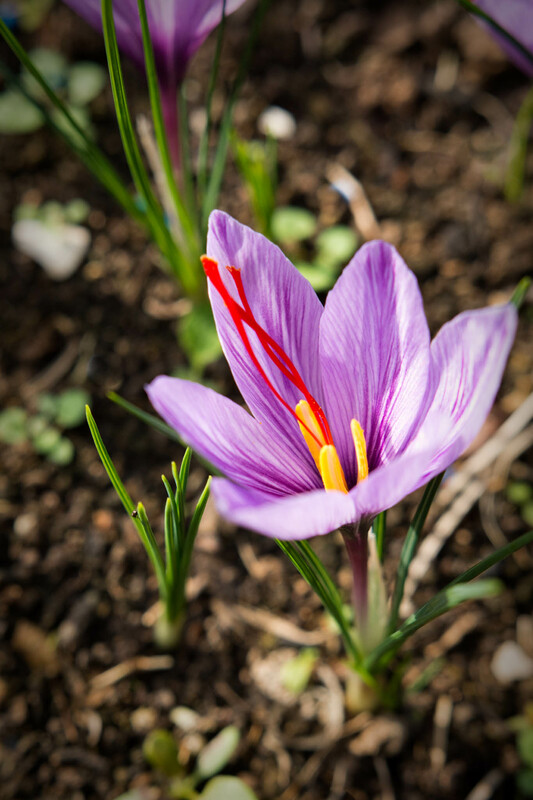 Only by collecting and re-planting the cormels, offshoots that sprout from the original corm during the growing season in the winter, can growers propagate the flowering plant that will produce saffron stigmas. How many genetic mutations occurred before the anonymous man or woman discovered its enchanting traits? I wonder, what were the sequence of events that led to its culinary and medicinal use? Was the significance of the discovery considered and was its value and reverence predicted? I speculate that the discovery was made due to an appreciation for colour before flavour, an intense desire to covet rich red. I can imagine a person picking autumn blooming crocus flowers at the edge of a forest after heavy dew. They find the stamens beaded with water and a bright red coloring has dissolved into the heavy, meandering droplets, leaving a vermillion trail wherever they wander. An observation of such a moment would lead the natural dyer to a swift conclusion that the stigmas could be used for dyeing. The natural dyer would soon discover that a dye liquor made from saffron would colour cloth in brilliant shades of golden yellow and not the red it appeared to have promised. And the aroma would lead to new experiments, in food. When fresh, saffron has no flavour. Only when dried does it impart the familiar hay-like fragrance and its metallic notes. To use it in food it is imperative that the strands be dried and then infused before incorporating them in a dish. To dry, I lay the fresh stigmas on kitchen paper to air dry. After a few days, I move the stigmas to a sheet of baking paper and place them in a pre-heated oven at 70 degrees Celsius. I keep a constant eye on them. They only need a minute or so. At intervals, I move them around with my fingertip, they become completely rigid when all of the moisture has evaporated and slide around easily on the paper. I immediately move them to a tube or jar for storage. To infuse, I find the best way to get the most out of the precious stigmas is to take the desired quantity of saffron in my fingertips and crush them into a small glass. A pinch or 20-25 stigmas will often be called for in a recipe. I pour freshly boiled water into the glass. About 50 mls. 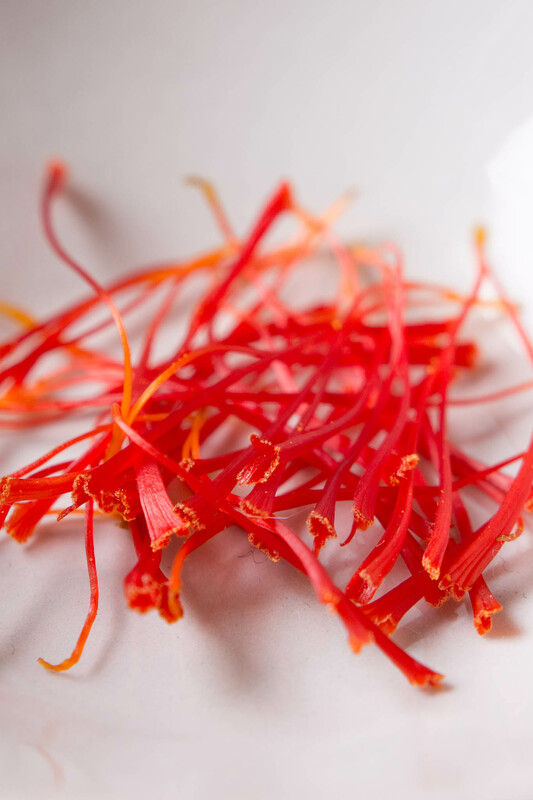 Then allow the saffron to infuse for at least 30 minutes. Alternatively, I often take advantage of having the wood burning stove alight and I place the liquid filled glass on top of the wood stove where it keeps between 60 and 80 degrees Celsius for four to five hours. I regularly top up the water level as it evaporates. The stigmas turn very pale, and almost appear to be merely stained with orange. This is a good sign that most of the colouring and flavour has been drawn out of the stigmas. 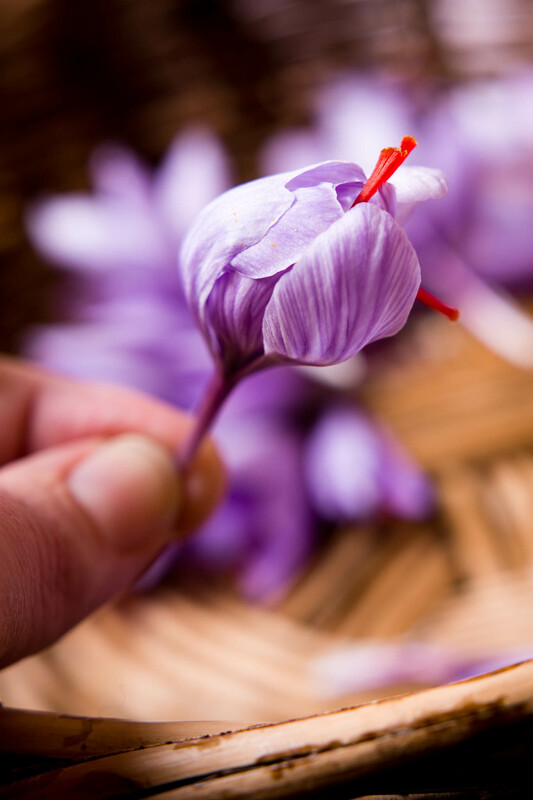 You must plant your saffron bulbs much earlier than your spring flowering bulbs. I plant in august or september. Here in France they flower in october, about 40 days after planting. If you can, buy your first corms from a reputable grower. I bought a new batch this year from Safranor here in France. They were beautifully healthy and a very good size. Every single bulb gave 1-2 flowers this year. Safranor also produce Crocus Cartwrightianus Albus, a beautiful white flowering saffron. They have an excellent planting and harvesting guide here. In the past I have purchased corms from a nursery that were labelled crocus sativus but came up as a standard flowering crocus. I’ve also purchased corms labelled crocus sativus that even after three years have still not flowered at all. You can easily fit one hundred corms in one square meter. This will give you at least 300 saffron strands in the first planting. The corms must remain planted after flowering. 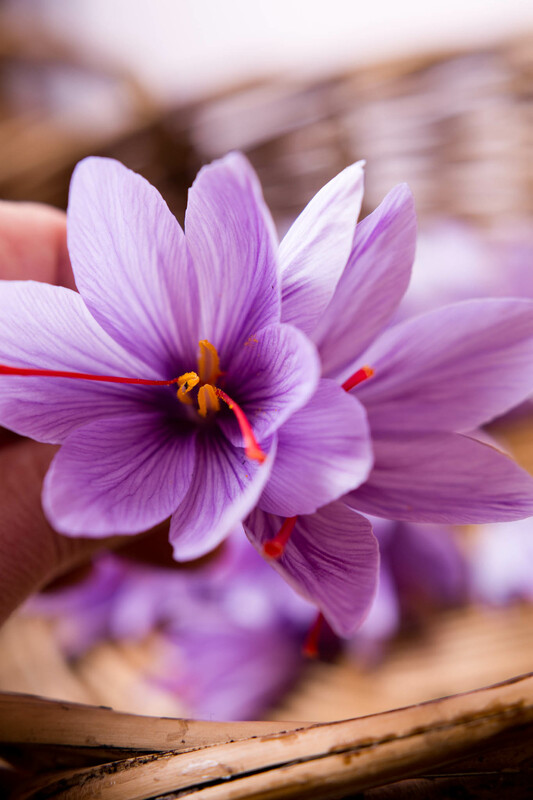 Saffron has a clever reversed vegetation cycle that first flowers then produces foliage and then grows cormels that allow the plant to be propagated. I recommend harvesting the whole flower so as to avoid a great deal of back ache and eye squinting. It is tempting to leave them to flower in the garden but they do not last long outdoors. The flowers will stay lovely for a couple of days when stood in a vase. Crocus corms like well drained soil with a rich amount of organic material. I have seen best results from growing them in my raised garden beds that are ‘no-dig’ and receive a 10 cm layer of compost at the end of the growing season every year. when you open a box of saffron, you will be seized by the same vertigo as an oenologist before a grand cru. 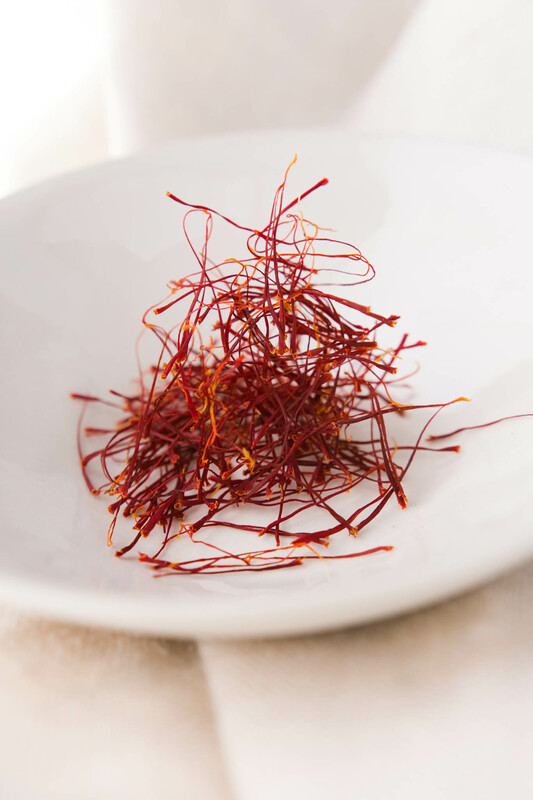 Saffron delights the eye, captivates the nose, seduces the mind. If you would like to forgo growing saffron altogether but are looking for a reputable saffron grower, we have one locally! Not far from our village, Danièle Kabacinski has a Saffron farm called Safran des Collines d’Artois. She sells her saffron in delicate little glass tubes and can be contacted via her website or Facebook page. If you are in Nord-pas-de-Calais, she attends a number of food fairs and markets that are listed here. Her farm is also open during flowering season. She produces a beautiful range of saffron products including saffron jelly, saffron syrup, saffron madeleines and saffron meringues. Photo 6: dried saffron, from my garden, on a MUD Australia Milk coloured dipping bowl sitting on a CROP linen napkin in the colour Natural.